When I first walked into Wilton’s Music Hall I thought I had entered a derelict building by mistake. With its austere crumbling facade and reception rooms stripped back to bare brick, it is quite the opposite of the plush Victorian grandeur I equate with Music Hall. Yet once I stepped into the cavernous auditorium with its gleaming barley sugar twist pillars and elaborate gilt balcony, I was captivated by the romance of this shabby old theatre. Alone in the gloom of the oldest surviving music hall in the world where as many as fifteen hundred pleasureseekers once came nightly to celebrate, the warm intensity of the atmosphere arrested me in my tracks. And I stood to gaze upon this sublimely resonant space – conjured for delight by John Wilton in 1859 – evoking familiar images of audience and performers by Sickert, Lautrec and all the other great painters of theatre and stage entertainments. I had come to meet Frances Mayhew and, from her reputation as the rescuer of Wilton’s, I was expecting a latter day Joan Littlewood. So I was pleasantly disarmed when she arrived and proved to be a glamorous young woman, lighthearted in a vintage crimplene dress and plimsolls – though as our conversation developed Frances revealed a shrewdness and resolve that make her a worthy successor to Miss Littlewood. As she took me around, Frances explained the chequered history of her beloved theatre. The area was a busy cosmopolitan dockland when John Wilton built his Music Hall – constructed in the back yard of five houses dating from the seventeen twenties housing The Prince of Denmark, an enormous pub renowned for its fine mahogany bar and named in honour of the Danish Embassy situated nearby in Wellclose Square. 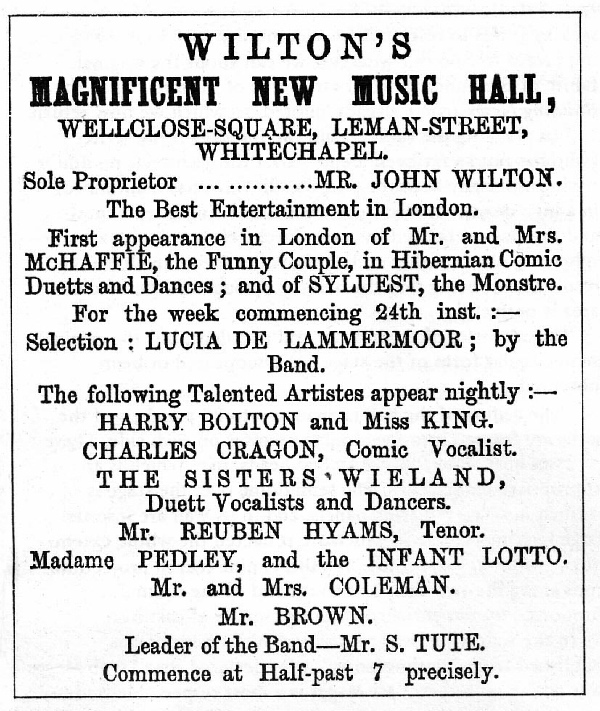 In the days when it was reputedly a landmark as famous as St Pauls, Champagne Charlie performed at Wilton’s and top acts from Covent Garden would race in carriages across London to give a second performance of the evening there. 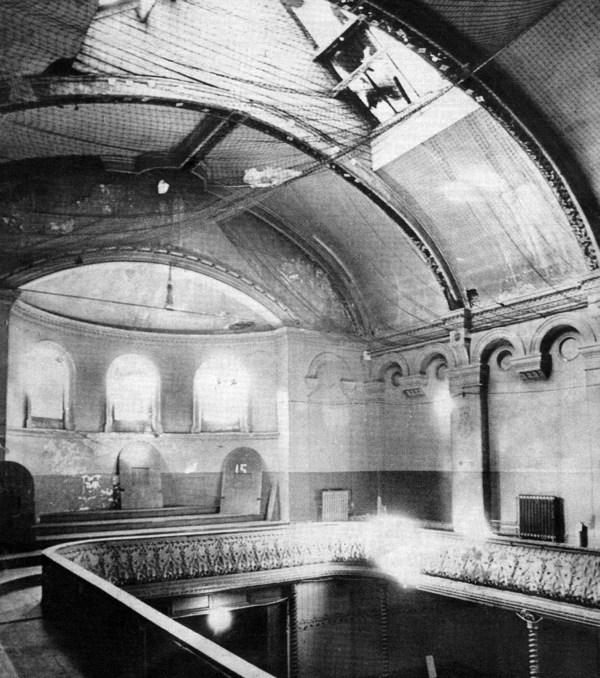 Constructed as an extension to the bar, it was among the earliest London music halls to open, yet it was superseded by custom built theatres by the end of the century. Taken over as a Methodist Mission in the eighteen eighties, two thousand meals a day were served there in the Dockers’ Strike of 1889, later it became a safe house for those escaping the fascists during the battle of Cable St in 1936 and during World War II served as a refuge for people bombed out of their homes. In spite of the building’s significance, it was only the intervention of Sir John Betjeman in 1960 that saved Wilton’s from demolition when all the surrounding streets were flattened. 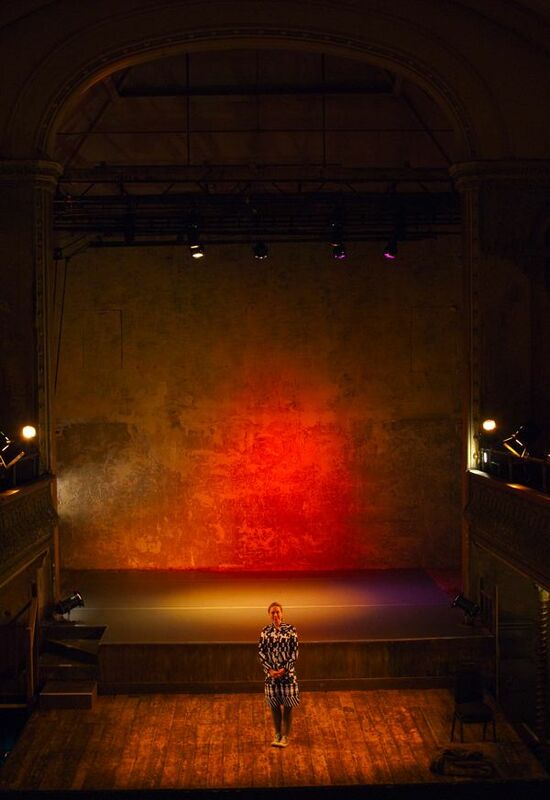 When Frances came along in 2004, Wilton’s had been empty for two years and the bank gave the management six months notice before repossessing the building in lieu of £250,000 debts – the outcome of a series of brave attempts to give the it new life as a performance venue. 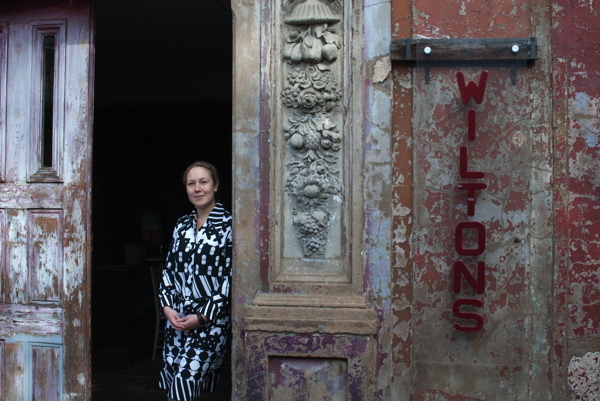 Learning of the plight of Wilton’s, with extraordinary courage and insight, Frances quit her job as a producer for International Management Group staging classical stadium concerts and came to work for no salary at first, as she attempted to save the shambolic old theatre that everyone else had abandoned. Frances’ resourceful mixture of romantic idealism and modest pragmatism is an appealing one that has saved the building from the receivers, but now she has the Victorian drains to contend with. Soaking away unseen beneath the houses that comprise the street frontage, they are creating subsidence moving the theatre away from the rest of the building, and she needs to apply for a capital grant from the National Lottery Fund to rectify this problem if the building is to remain open. 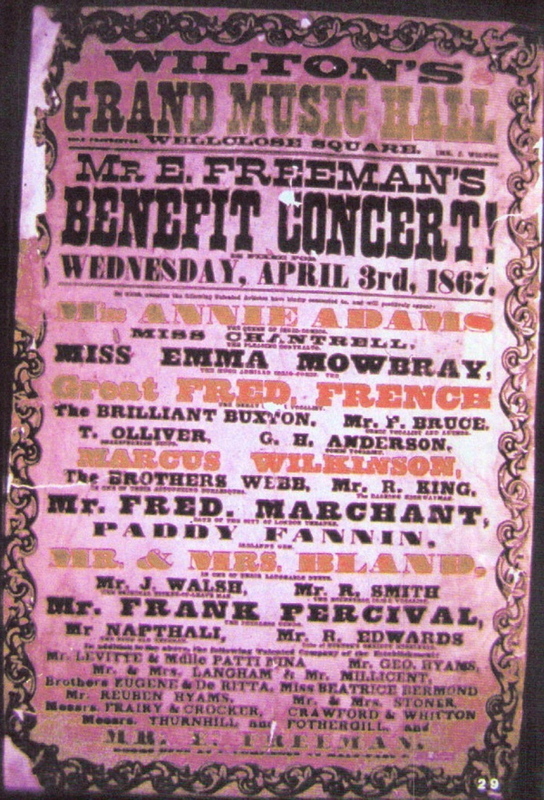 Yet with the enterprise financially stable and Wilton’s re-established at the heart of its community, presenting plays, opera and music hall, Frances has proved herself the worthy custodian of this venerable music hall and is prepared for the next challenge. The place was full of young actors, rehearsing, warming up and being flamboyant in that bold carefree way which is characteristic of their profession. The place was alive, demonstrating that the world of the theatre is a one of youth and fleeting spontaneity. Yet while performance requires a space where imaginative freedom can be enacted, Frances knows that the architecture of romance also requires an income, debts paid and drainage that functions. I wondered what motivated her to take it on, working behind the scenes and dealing with the mundane offstage drama. She became guarded, looking daunted when I asked if Wilton’s Music Hall is her life’s work, but then she confessed, “I suppose it is quite personal because it’s become a big responsibility. I can’t repair the building at the rate it is crumbling. When I first came here I just wanted to see if it could be rescued, but now I have ambitions for what I want it to be.” Hearing this last admission and sensing her withheld emotion, I realised that after five years Frances is just beginning her work at Wilton’s Music Hall and this story is not just about the past but about the future too. 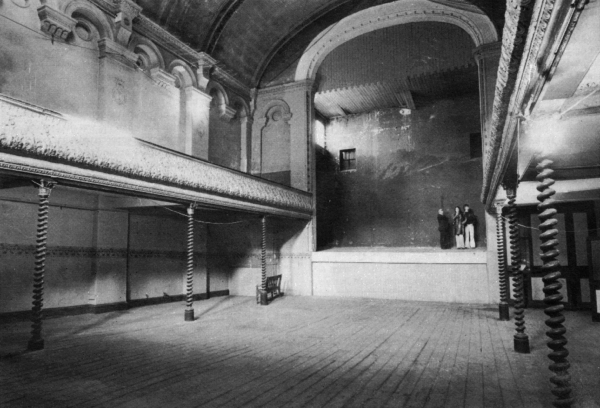 A rare image of a performance in the early days of Wilton’s Music Hall. By the 1970s, Wilton’s had fallen into neglect. Frances Mayhew at the entrance to Wilton’s Music Hall in Graces Alley. 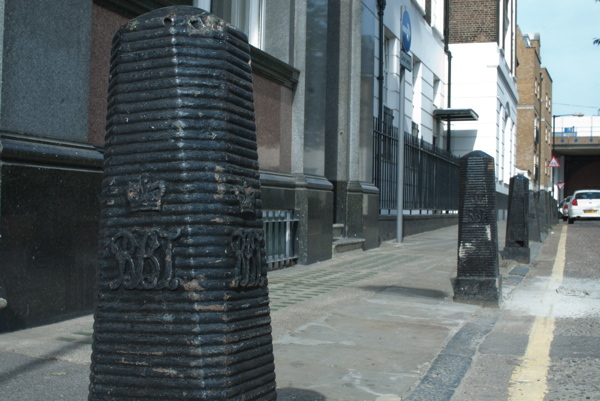 Fifty yards from Wilton’s, these ten bollards are all that remain of the Royal Brunswick Theatre, one of the East End’s many lost theatres. 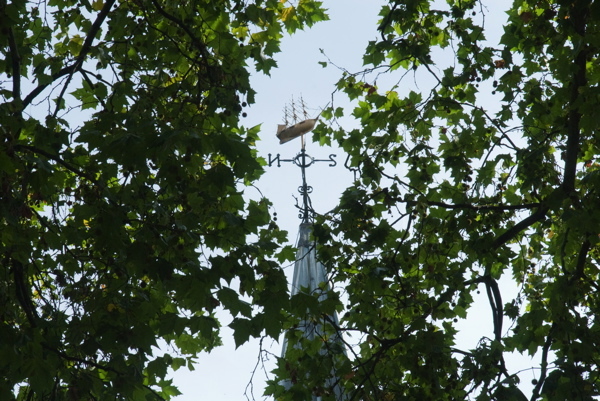 The weathervane on St Paul’s School, Wellclose Square, reminds us this was once dockland. 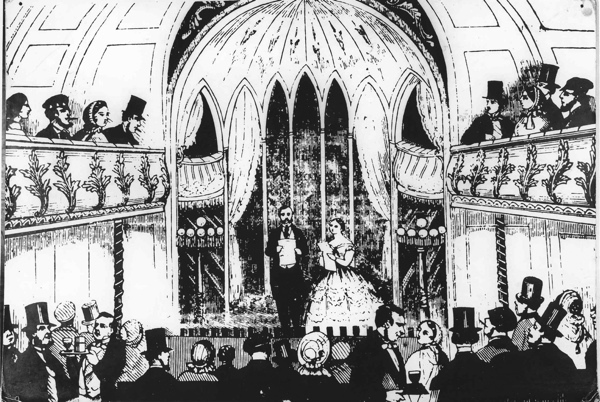 Note the gentlemen wearing top hats in the audience during a performance. That must have been extremely annoying in the rows behind! I absolutely love this place…it’s a hidden gem and such a fantastic building. Saw The Divine Comedy there earlier this year. Well done for writing about it….it has such an interesting history. And even more well done to Frances Mayhew! What a wonderful piece of history in such a well-written (and much needed) article. Even across the pond, spaces like this demand our attention. just saw this article and well done Frances although it does seem aworrying problem re drain probs.I do hope you get the funding you need.I do understand ones need to preserve the glorious building so good luck. My dad, Moss Levy, was born on Graces Alley in 1927 and grew up in a building which was demolished and is now flats round the corner. His parents were Dinah and Lewis Levy who had a stall in Petticoat lane (selling second hand false teeth! ), worked in the docks and as a cigar maker. I visisted for the Cable Street Commemoration in 2011 and was moved to tears. 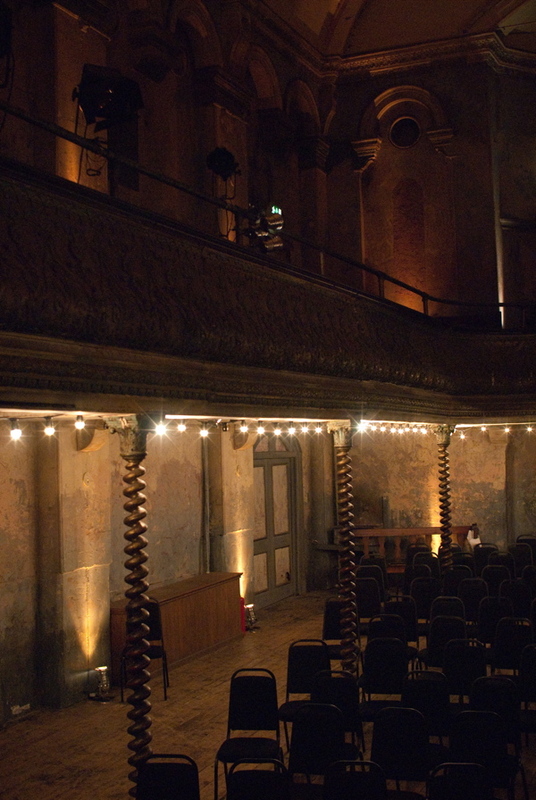 Was it Wilton’s I saw in the recent ‘Dancing on the Edge’ by Stephen Poliakoff? Such good work: I can’t wait to visit again. My heartfelt best wishes. dads memories are all documented in a book illustrated by his wife, Laura, and gives a first hand account of the life and times in the old east end for a large family surviving the poverty and anti-Semitism of pre war London. He was a witness to the battle of cable street. The family skeleton is the fact that one of our ancestors was one of the main suspects reputed to be jack the ripper, a one joseph levy. I am a grandfather now, and intent to take my oldest grandson to graces alley and show him his roots, and explain his family history. Dads mother Dinah used to play the piano in the ‘Old mahogany bar’ wiltons music hall. My mum was born on Graces Alley (no. 7) in 1935. She had an older sister and brother who sadly passed away a few of years ago, but he would have been about the same age as your Dad. They were the McDonalds (Alec, Mary and Shirley) and were related to the Freshwater and Ottolangui families who also lived in Graces Alley. I took my children last weekend to have a look around and show them their roots. Where can I get a copy of your Dad’s book? Lorraine, the book was a self made effort, dad made it just for the family, only 10 copies were made , however phone me on 07860-715603, and we will sort something out. The freshwaters were mentioned as they were somehow connected to the family. dad and his four brothers and five sisters started life at No 1, and ended up at No 7 graces alley, that is what I am led to believe. Give us a bell, it would be nice to hear from you, be lucky, Tony Levy. This maight be a long shot but does anyone have any information about the Ottolangui family in Grace’s Alley? Hi Bryan. My grandparents lived at, I believe, No 7. As did I for a while. What would you like to know about the Ottolangui family.